So if you were watching/reading my blog over the weekend, you heard about a large purchase of minis from my LCS. It was work to sort and arrange the cards, but all the work in complete. How did it all end up? I was getting to that. There were a grand total of 920 minis in the box. The two Upper Deck Goodwins were nothing wonderful, so I won't even discuss them. There were 18 T206 from a couple years. Lots of different backs - Piedmont, Polar Bear, Baseball Caramels and Old Mill. Here's my choice of the best. Not too shabby. I like those Historical Events on the bottom. I have 6 of them - I think the set is 10. 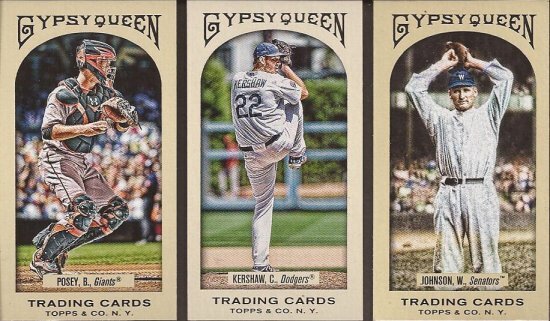 Next lowest number in the box were 2011 Gypsy Queen. I more than tripled what I had with the 31 in the box. Again, here's the best in my book. I had none of the insert minis. I now have this Great One of Rogers and a Future Star of Matusz. I have two of the black minis with this Thome and Ian Desmond. That Yaz is just a great picture. More great 2011 minis. Look REALLY close at the Kershaw in the middle. 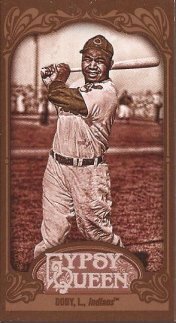 This is one of the color variation minis that came from a hobby box of 2011 GQ. These are guesstimated to be a run of 135 for each card. All you Dodger fans salivating? I am going to make it real easy - if you want that Kershaw, I need a replacement color variation mini. These were only from the first 100 in the set. There are a few players out of the first 100 that would spark me to trade for Clayton. 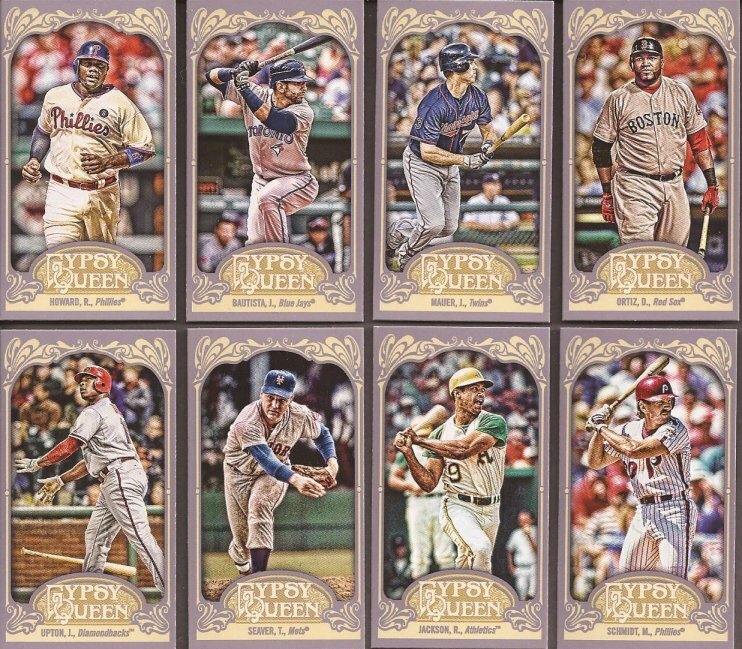 There were 44 minis from the 2012 Gypsy Queen. Out of those cards I pulled 8 SP variations. And also got my 2nd hit in the box (I call that Clayton #1). Larry Body sepia mini 82/99. Great card. 2011 Allen and Ginter next. Here is where the first dupes showed up. From the base and inserts, I had 85 cards. However, while sorting them, I realized that I am not going for the set, so I just pulled the couple I wanted for the group. What I did end up with was a lot of cards for the mini subsets. While I was not able to complete any of the subsets, I did get a great start on all of them. I never got to appreciate the 2011 mini subsets, so it was nice to get a good run at them all. That Shawn Michaels I featured on a SIL many months ago. Now I have the black bordered version. 2011 Topps Kimballs came in with a whopping 245 cards. Prior to this purchase, I had about 40 Kimballs in my binder. Now, I have a complete set above 101 and half the set below that. The previous owner of these minis must have went bonkers buying 2011 Update, considering the number of duplicates I have over 101. Forgive me, but I'm not scanning for this section. 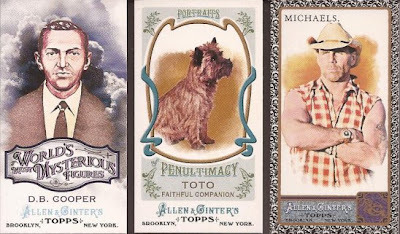 Lastly comes 2010 Allen and Ginter. At a jaw dropping 513 cards, this just floored me. 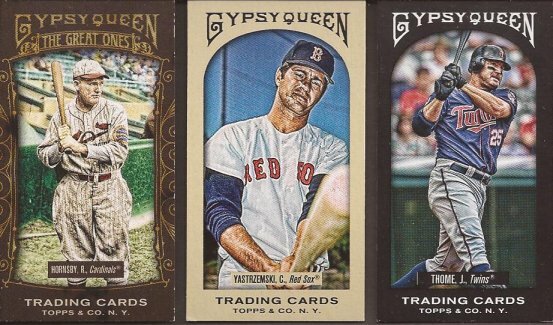 I wish none were duplicate, but I ran about 28% dupe in the base and about 21% with the insert sets. 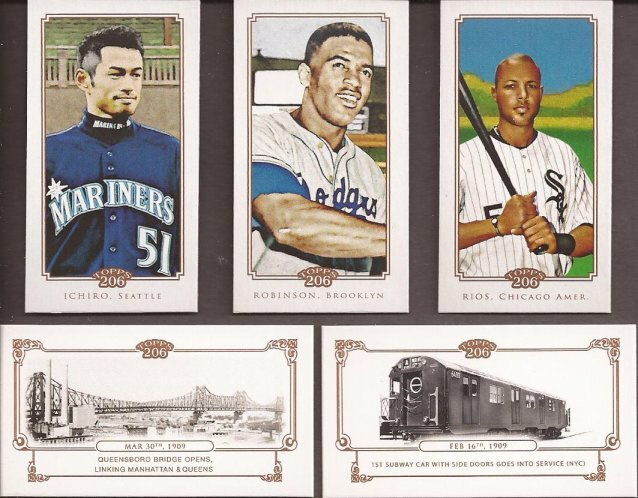 However, I am just over halfway to a complete 2011 minis set, and completed so many of the insert sets. Lord of Olympus - 1 short. Sailors of the Seven Seas - complete. National Animals - 10 short. World's Wordsmiths - 1 short. Monsters of the Mesozoic - complete. The owner also was going after ad backs as more than half were just that. The xray card is what makes A&G fun. I hope we get more like that in 2013. 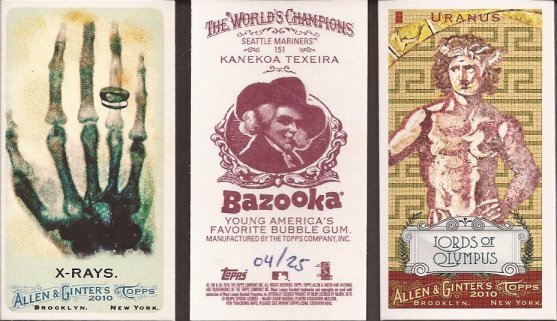 There is my third hit in the cards with a 4/25 Bazooka back of Lanekoa Texeira. And 10 year old me just wanted to post that Lord of Olympus card. So that's how I did. It was fun and I certainly got a lot for my money. Not counting the box of 100 pages I got in the deal, the minis came out to 6 and a half pennies per card. Factor in that $20 box and the minis drop to just over 4 cents per card. So - who needs minis??? Head on over to the new mini trade bait page and pick out what you want. Then, get over to my A&G wants page and decide what you have that will help me. Then, we trade. Baby steps, folks. I'll get there with baby steps. Wow, that's a lot of minis. And that's a lot of homework you're asking me to do. I'll get back to you ... around May.